Sample shown with Black ink and optional Black Glossy lining. $54.95 As Low As $1.10 ea. A set of 50 foldover note cards. 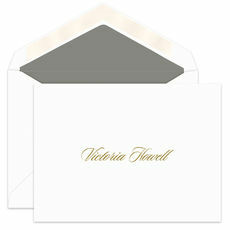 Ecru cards with an embossed frame surrounds your raised ink personalization. Ink color of your choice. Size is 6.25" x 4.625". 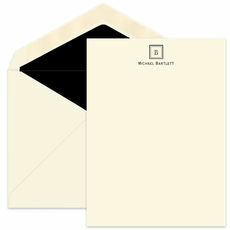 Blank matching envelopes included. Lined envelopes and flat printed return address imprint available. Positioning and typestyle as shown.